The questions are asked at the beginning of the interview process, “how much are you expecting to make” or “what is your salary range” or the one that always makes my skin crawl a little bit is “what are you currently making” the answer I always want to say is, “it’s none of your damn business” but then again, that wouldn’t be an appropriate response in the interview process. If you fall within the range they are willing to pay, the interview process continues. Now the question may come up again at the end prior to them making you an offer to ensure that when they make the offer that they fall within your range or they skip that question and just go right to making you an offer. This is point where it’s easy to negotiate if you are currently employed because you have leverage to negotiate exactly what you want and if the terms aren’t acceptable, you can walk away. 1.) Know your worth. What are people in your geographic area and your profession making annually? 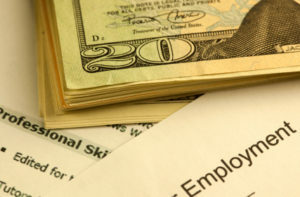 You can use sites like PayScale.com, Glassdoor.com or Salary.com to find out. Another resource are industry recruiters, it’s their job to know what is the going rate for a second year Java Programmer, talk to them and see where things stand. Keep that information in your hip pocket, it may come in handy during the negotiations. 2.) When you give a scale or a range in pay you’d like to receive, err on the higher side rather than middle or lower. Don’t be ridiculous, rather, ask for something that is aggressive yet comparable for that industry. In fact, according to researchers at the Columbia Business School, you should ask for an exact number like $79,760 rather than $80,000. When employees use precise numbers, they are more likely to get a final offer closer to what they were hoping. The employer assumes you’ve done more extensive research into your market value rather than just winging it. 4.) There’s more to the package than salary. If there is no wiggle room on salary, there are other components that may just wiggle like benefits, vacation, perks and bonuses. Don’t fear the word “no” embrace it as an opportunity to get a little more of something else. However you go about securing your offer, always keep this mantra in mind, be respectful. This is very small world and it would be terrible a faux pas on your part today wreaks havoc on your life again and again in the future. Here are some other techniques for salary negotiations.